GOVERNMENT OF TELANGANA, HM&FW Dept. 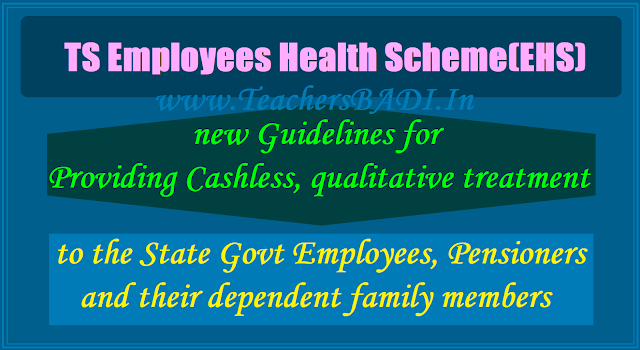 - Employees Health Scheme - Providing Cashless and qualitative treatment to the State Government Employees, Pensioners and their dependent family members - Comprehensive guidelines - Orders - Issued. 1. AP Integrated Medical Attendance Rules, 1972 amended from time to time up to G.O.Ms.No.74, HM&FW(K1) Dept, dt.15-03-2005 amended in G.O.Ms.No.105, HM&FW(K1) Dept., dt. 09-04-2007. 2. G.O.Ms.No.184, HM&FW(M2) Dept., Dated: 14-08-2012. 3. G.O.Ms.No.186, HM&FW(M2) Dept., Dated: 14-08-2012. 4. G.O.Ms.No. 174, HM & FW (M2) Department, dt. 01.11.2013. 5. G.O.Ms.No. 175. HM & FW (M2) Department, dt: 01-11-2013. 6. G.O.Ms.No. 176, HM & FW (M2) Department, dt: 01-11-2013. 7. G.O.Ms.No. 32, HM & FW (A2) Department, dt: 03-11-2014. 8. G.O.Ms.No.33, HM & FW (A2) Department, dt 13.11.2014. 9. G.O.Ms.No.36 HM & FW (A2) Department, dated 27.11.2014. 10. G.O.Ms.No.40, HM&FW (A2) Department, dated:1-12-2014. 13. G.O.Ms.No.64, HM&FW (A2) Department, dated: 27-7-2015. 14. G.O.Rt.No.666, LET&F (IMS) Dept., Dated: 24-09-2016. 15. Govt.Lr.No.9851/A1/2016, Dt: 27-09-2016 of Principal Secretary to Govt. HM&FW(A1) Dept.16. Minutes of the Committee held on 22-10-2016. 17. Minutes of the Meeting held on 04-11-2016 conducted by the Hon’ble Minister for HM&FW. 18. The Chief Executive Officer (FAC), EHS & JHS, AHCT, Hyderabad in Lr.No.AHCT/EHS/Accts/102/2016, Dt:22-02-2017. The Chief Executive Officer(FAC), EHS & JHS, AHCT, Telangana, Hyderabad has submitted that in reference 2nd read above, Government have approved the Employees Health Care Fund Scheme (EHF) to provide cashless treatment to all the State Government employees including the State Government pensioners, along with their dependent family members through a network of empanelled hospitals of Aarogyasri Health Care Trust, in lieu of the medical reimbursement system under ‘The Andhra Pradesh Integrated Medical Attendance Rules, 1972 (APIMA Rules, 1972). Simultaneously, in reference 3rd read above, operational guidelines for implementation of the Scheme were issued delineating the role of Government functionary as well as individual beneficiary. Further in reference 4th read above, the Government have revised the EHF scheme and issued orders notifying the “ Employees Health Scheme” (EHS) and its implementation with immediate effect. In the reference 5th read above, operational guidelines for issue of Health cards have been issued and vide reference 6th read above, Government have fixed final therapy prices. 2. In reference 7th read above, certain modifications have been made to the “EHS” by the Government of Telangana State and directed to implement the Scheme w.e.f. 01.11.2014. The Employees Health Scheme is formulated to provide cashless treatment to the employees and pensioners of the State Government and their dependent family members which will ipso facto replace the existing medical reimbursement system under APIMA Rules, 1972, with additional benefits such as post–operative care and treatment of chronic diseases which do not require hospitalisation and treatment in empanelled hospitals. 3. Further in the reference 13th read above, the Government have decided to provide comprehensive health coverage to the working and retired Journalists in Telangana State similar to the Employees Health Scheme while issuing guidelines for implementation of ‘Working and retired Journalists Scheme‘ by Aarogyasri Health Care Trust. 1) Chief Executive Officer, Aarogyasri Scheme2) Chief Executive Officer, Employees/Journalists Health Scheme. 5. The AHCT Executive Board have reviewed the implementation of the Employees Health Scheme and Journalist Health Scheme on 22-10-2016 and felt that a Committee shall be formed to review on the packages (Medical, Surgical ) and providing outpatient treatment. Accordingly the AHCT Board have constituted the Committee with the following members. 1) Vice-Chancellor & Supdt. MGM General Hospital, Warangal. 5) Executive Officer (P&C) AHCT, Hyderabad. 2) Grade the hospitals taking into consideration the infrastructure, facilities available, specialists available, etc. 3) Increase of 20% on existing surgical and medical package prices for non-NABH and other-NABH hospitals. 4) Revised surgical packages, Day Care Procedures, Dialysis, medical emergencies, Organ Transplantation, Robotic Surgery,Bone Marrow and unbundling of medical management in respect of NABH Super Speciality Hospitals. 7. In a meeting held on 04-11-2016 by Hon’ble Minister for Health, Medical and Family Welfare and Chief Secretary to Government, it has been decided to provide O.P. treatment through Wellness Centres and also considered the long pending demands of NABH accredited Super Speciality Hospitals for revised surgical package prices and unbundling of medical management procedures as recommended by the Committee. The coverage of beneficiaries under the Employees Health scheme (EHS) and Journalists Health Scheme (JHS) will be done as per G.O.Ms.No. 174, HM & FW (M2) Department, dt. 01.11.2013. The details of Journalists covered under Journalist Health Scheme will be collected by the Information & Public Relations Department and forwarded to the EHS/JHS for feeding the data and generate the health cards. The Information & Public Relations Department is the nodal agency for enrolment of Journalists under Journalists Health Scheme in G.O.Ms.No.64, HM&FW (A2) Department, dated: 27-7-2015. Operational guidelines under Employees Health Scheme for enrolment of beneficiaries and role of Government functionary as well as individual beneficiary as envisaged in G.O.Ms.No. 175. HM & FW (M2) Department, dt: 01-11-2013 will be implemented. Out-Patient Treatment: Out-patient treatment will be provided through Wellness Centres only. Out-patient services offered at Wellness Centres: Consultation including OP Treatment for common ailments, ophthalmic, dental, ENT, paediatric and pre-defined long-term (chronic) diseases which includes, Diabetes, Hypertension, Physiotherapy, Coronary Artery diseases, Cerebro Vascular diseases, cancer, renal failure, Tuberculosis, Leprosy, Rheumatology, Arthritis, SLE, Auto Immune Diseases, Urology, Orthopaedics and all other ailments requiring short and long-term sustained medical treatment will be provided. d. Radiological investigations: X-Ray, Ultra-sound scan ECG services Gynaecology investigations, Pap smear test, Mammogram Pulmonary Function Test and Diet Counselling Pre-operative and Post-Operative investigations Any regular investigations / high end investigations as per the requirement. f. AYUSH facility: Indian System of Medicine through Ayurvedic and Homeopathy will be provided at the Wellness Centres. g. Pharmacy: All prescribed medicines, surgical consumables, supportive accessories, emergency drugs, life-saving medicines for long termusage (Ophthalmic, Dental, ENT, Paediatric and pre-defined long-term chronic diseases which includes, Diabetes, Hypertension, Physiotherapy,Coronary Artery diseases, Cerebro Vascular diseases, Cancer, Renal failure, Tuberculosis, Leprosy, Rheumatology, Arthritis, Rheumatoid Arthritis, SLE, Auto Immune Diseases, Urology, Orthopaedics, Renal, Pre& Post Renal Transplantation medicines, Cardiac, Psychiatric, Hormonal, Cancer, GIT, Neuro medicines or any other medicine/drug required to the patient) will be provided through Wellness Centres. h. Referrals by Wellness Centres: Referrals with regard to Investigations: Investigations which are not covered in the above categories will be referred to tie-up Diagnostic Centres (NABL) on cashless referral mechanism. i. Referrals with regard to In-patient Treatment: Beneficiary shall attend outpatient treatment at the Wellness Centres and all necessary investigations will be carried at the Centre. Cases requiring in-patient treatment will be referred from Wellness Centre to empanelled network hospital by issuing a referral letter. j. Emergency Direct Admission: In case of emergency, patient can get admitted at the nearest empanelled network hospital and communicate the same to the EHS authorities within 48 hours for consideration,preferably immediately. k. Ailments / Conditions for Emergency Admission:The following ailments may be treated as emergency which is illustrative only and not exhaustive, depending on the condition of the patient. Paroxysmal Supra Ventricular Tachycardia, Cardiac Temponade, Acute Left Ventricular Failure, Severe Congestive Cardiac Failure, Accelerated Hypertension, Complete Heart Block and Stoke Adam Attack, Acute Aortic Dissection. ii. Acute Limb Ischemia, Rupture of Aneurysm, Medical and Surgical shock and peripheral circulatory failure. v. Road Traffic Accidents with injuries including fall- severe. vi. Haemorrhage due to any cause. vii. Acute poisoning, Snake bite / Scorpion sting viii. Acute Renal Failure. xxi. Any other ailment which requires admission and immediate attention. xxii. Any other life threatening condition. - For Non-NABH and other NABH, if the cost of the treatment exceeds the package price, the CEO EHS/JHS is authorised to review and consider the case for payment. 2. NABH Super Specialty Hospitals: As per the recommendation of the Committee, Government considered for revised package prices for surgical specialities, Day Care procedures, Dialysis, Bone Marrow, Organ Transplantation, Robotic Surgery and with unbundling of medical management procedures. The list of surgical procedures with package prices for NABH Super Speciality Hospitals is shown at Annexure-III. The lists of medical management procedures with package prices for NABH Super Speciality Hospitals are shown at Annexure-IV. The list of investigations with 50% hike on NIMS rates are shown at Annexure-V. The list of investigations not available in NIMS with 25% discounted rates are shown in Annexure-VI. 3. As NIMS is the only super speciality hospital under Government Sector, unbundling of medical management and surgical packages will be considered as per NIMS tariff only. 4. In unbundling of medical procedures, daily updation of the treatment for package price amount of two lakhs / five lakhs / 7 lakhs / 10 lakhs and above, a check point will be provided. For Claim Upto 5 lakhs - a review by the physician and for claim above 5 lakhs - a review by a committee will be done regarding treatment, procedure, condition of the patient. After review, the check points shall be enabled for utilization management as a cost containment strategy. 5. For medical management cases, telephonic intimation shall be given to EHS within 24 hours. However no special approvals required for non- emergency cases upto Rs.50,000/- and for critical cases upto Rs.1,00,000/- and the Medico of the concerned hospital can directly upload the pre-auth details and treatment can be initiated. 6. End-Stage-Care: Necessary steps shall be taken to avoid protracted burdensome, unwanted treatment / unnecessary interventions. High dependency care ward / palliative/chronic care treatment ward to be provided in every Hospital as a supportive care to the patients in last stage will not b e covered under the scheme subject to consultation of spouse / legal heirs of the patient. 7. The patient has to pay on his own above the package amount, if opted for higher accommodation/stay beyond the package period/cost of implants/stents/devices etc. 8. Aarogyasri field staff shall guide and facilitate the patients from time of registration till the time of discharge. 9. The network hospital will earmark one of their staff as EHS liaison assistant to liaise with EHS patients. 10. Outside the State: Pre-approvals from the EHS authorities shall be obtained by duly submitting the estimates for the cases where the treatment cannot be provided within the State and requiring outside state medical plan, followed by periodical review check-up after treatment. However, in case of emergencies, the patient covered under EHS can get admitted in any hospital outside the state and intimate to the EHS authorities within 24 – 48 hours. In this case, the beneficiary shall furnish the emergency, essentiality certificates, original invoices to the EHS authorities after treatment. Payment shall be made according to the fixed surgical package prices and payment shall be done as per the recommendation of Committee in respect of medical treatment. 11. The Chief Executive Officer, EHS & JHS is authorized to make relaxation in Pre / Post authorization method, in case of emergencies. 12. Any irregularities or misuse committed by the beneficiaries (Employees/ Pensioners & Journalist) coming to the notice of Government will entail disciplinary action as per A.P.C.S. (CCA) Rules, 1991, besides penal action as per law. 13. Any irregularities or misuse committed by the beneficiaries (Working and Retired Journalists) coming to the notice of the Government, will entail forfeiture of benefits under the scheme in the future, besides penal action as per law. 1. There will be no upper limit on the financial coverage for out-patient and in-patient treatment and the total cost of treatment for the enlisted therapies will be covered under the Scheme. 2. The beneficiaries will be eligible for actual expenditure per episode of illness with no limit on the number of episodes. 1. The Chief Executive Officer, EHS & JHS will implement the Employees Health Scheme and Journalists Health Scheme under the supervision of Government of Telangana. The scheme shall be governed by AHCT Board of Trustees and necessary amendments will be made in the bye-laws of AHCT Trust Deed. 2. To ensure effective functioning of EHS & JHS, the Chief Executive Officer, EHS & JHS is delegated with all Administrative and Financial Powers of on same lines of CEO, AHCT. 1. Engage Staff on outsourcing basis/deputation basis with required skills and experience, for Administration, Operations (pre authorisations and claims) and Vigilance required in headquarters office for implementation of the scheme as per the cadre strength sanctioned by the Government. 2. The services of field staff of Aarogyasri shall be utilized. 3. Engage specialist doctors for pre-authorization and claim processing of cases referred to it under the new scheme on payment on a per-case-basis will be adopted as per the approvals of AHCT Board of Trusties. 4. Service provider for I.T supportive services will be adopted in accordance with the Aarogyasri Scheme. 5. Appoint a nodal officer to coordinate with all stakeholders and redress the grievances. 1. In the first phase, six (6) Wellness Centres in the Twin Cities i.e. Hyderabad and Secunderabad and eight (8) Wellness Centres in the erstwhile district headquarters of Telangana State will be established for providing OP treatment. Depending on the demand and geographical necessity, more Wellness Centres shall be established with the approval of competent authority. 2. To engage required Staff on outsourcing basis with necessary skills and experience (Doctors/Speciality Doctors/Para Medical staff/Data Entry Operators/House Keeping/Security, etc) to run Wellness Centres. 3. To procure required lab equipment / furniture / any other requirement as per the rate contract of TSMSIDC/NIMS or any other institutional procedure or any other prescribed procuring methods mentioned under Financial Rules. To place reagent based equipment or investigation based equipment to avoid interruption. 4. To procure Medicines/drugs, Surgical items, consumables, Supporting accessories as per rate contract of TSMSIDC/NIMS/CGHS/ESI or local empanelled chemists or by following other procuring methods mentioned under Financial Rules. 5. Internal Committee shall be constituted to assess the requirements of medicines, surgical items, consumables etc., and accordingly purchase shall be made. 6. To enter into agreement with private lab service providers for the investigation services not provided at Wellness Centres on CGHS /NIMS/ESI model. 7. The CEO-EHS is authorized to establish additional Wellness Centres with required staff as per the demand / requirement and load of the EHS & JHS patients with the approval of competent authority. 8. All Wellness Centres shall be established in the same pattern in respect of Specialities / staff / equipment, etc. 1. Guidelines for empanelment of hospitals with in the State and outside, pre- authorization and other modalities while implementing the Employees Health Scheme will be in conformity with the existing standard procedures being followed in Aarogyasri Scheme. 2. Empanelled hospitals resorting to irregularities or misuse shall be black listed and entire amount recovered besides launching criminal action. 4. Grading of Hospitals in respect of non-NABH Hospitals and discounted rates will be finalized by CEO EHS taking into criteria of standards and quality of services of Hospital. 5. Enter into Service Agreements with the network hospitals. 6. The C.E.O. is authorised to empanel / de-empanel network hospitals, private nursing homes as per necessity in conformity of standard procedures. 1. Payments under the Employees Health Scheme / Journalists Health Scheme will be based on approved package prices. The control prices with regard to implants, drugs, etc announced by the Government, if any, will be reduced accordingly in the package prices. All the payments shall be done following FIFO. 2. Non-NABH and other NABH: The period from the date of reporting to hospital to 10 days after the date of discharge from the hospital will be treated as part of the package. The package will include the entire range of investigations, medicines, implants, consumables, diet, post-operations / post- treatment complications and follow-up care arising from the therapeutic intervention. 3. In respect of NABH accredited Super Speciality Hospitals, the payment will be done according to the surgical packages. Additional amount for consumables (implants, stent, mesh, etc.) shall be paid separately. Payment shall be made on actual claims for the medical management procedures. - However, all the payments in respect of NABH accredited Super Speciality Hospitals shall be made after scrutiny of unbundling medical care bills in comparison with each case sheet. 4. The Chief Executive Officer, Employees Health Scheme, is authorized to include any additional inputs, which may be required during the course of implementation of the scheme, code them, finalize the prices and append the same in the Medical Input Code Book and Standard Schedule of Rates (SSR) subsequently. 5. The Chief Executive Officer, Employees Health Scheme is authorized to review the approved surgical package prices in respect of NABH Multi Speciality / Super Speciality/non-NABH hospitals and unbundling of medical procedural management from time to time. With the approval of Board of Government. 6. The Chief Executive Officer, Employees Health Scheme is authorized to implement respective packages to Non-NABH/NABH Hospitals upon their up- gradation as NABH/NABH Multi-Specialty, NABH Super specialty. 7. The Chief Executive Officer, Employees Health Scheme is authorized to utilize the available funds for payments in respect of cases treated outside the state in emergency. 1. The services of existing service provider of AHCT will be utilized. 2. The existing software / website will be utilized and proposed to permit the CEO, EHS for development of new modules as and when required. Customization of software application shall be made periodically as per suggestions of the High Power Committee. Audit : Medical Audit / Financial Audit shall be conducted by the Chief Executive Officer, EHS & JHS periodically. 1. At present the budget is being provided under MH 017 and 043 in the budget line of all the Government Departments for providing medical reimbursement to the Employees, Pensioners and dependent family members. Also Medical allowance of Rs.350/- is being provided to the pensioners. The above Budget will be earmarked under EHS from F.Y 2017-18 onwards for providing medical services through Employees Health Scheme. 2. The entire Budget under Employees Health Scheme & Journalists Health Scheme (for Employees, Pensioners, Journalists ) will be provided as per the actual expenditure incurred. 3. The CEO, EHS & JHS is authorized to utilize the entire budget combinedly though provided under different heads for smooth implementation of EHS and JHS schemes. 10. The CEO (FAC), EHS & JHS, AHCT, Hyderabad has proposed and requested the Government to accord necessary powers, authorizations, orders for modification and implementation of EHS/JHS scheme by incorporating all the above i.e. Establishment of Headquarters office, Delegation of powers to CEO EHS & JHS, Deployment of IT infrastructure, Establishment of Wellness Centres with man power, Procurement of Infrastructure/equipment/ medicines/consumables/reagents to Wellness Centres, Providing in-patient treatment, Hospital Empanelment, Hospital Payments etc., to provide effective and qualitative services to the employees and journalists. 11. The Government have examined the entire matter and the CEO (FAC), EHS & JHS, AHCT, Telangana, Hyderabad hereby accord permission and delegate powers to implementation of the EHS / JHS scheme subject to approval of the Governing Council and Executive Board of the AHCT at time to time on the lines of AHCT. 12. The Chief Executive Officer, EHS & JHS, AHCT, Telangana, Hyderabad shall take necessary action accordingly. 13. These orders will come into force with effect from 17-12-2016. 14. This orders issues with the concurrence of Finance (EBS.V) Dept., vide their U.O. Note No.6018/212/A2/EBS.V/2017, dt: 06-06-2017. "List of package prices for non-NABH and other NABH Hospitals"
My daughter suffering with cyst (abdomen) doctors are suggested undergo open surgery. we are to planning to surgery at our nearest private hospital. How can we claiming reimbursement from Telangana government. I am a pensioner.